European part of Russia (central regions), Crimea, the Caucasus, Aralo-Caspian region, western Siberia, Balkan Peninsula and Anatolia. In steppes, semideserts, foothills, plains and other dry habitats. Plant 20-40 cm, stem glabrous, brown-green. Leaves 3-4, long, grey green. Flowers brown-greenish externally, yellowish along margin, yellow inside, with green blotch. Filaments yellow, tomentose at the base. Anthers yellow, 1/3-1/2 as long as stamens. V - early spring to late spring. Fl - April. Fr - May (in St. Petersburg). Freely produces daughter bulbs. Does well in dry locations. Z 4 (3). New. Central Asia (Pamiro Alay, western Tien Shan, and Syr-Darya River basin). Clay and stony slopes from foothills up to 2,400 m.
Plants 15-20 cm. Stem densely pubescent, anthocyanin-brown leaves in pairs, linear-lanceolate, sulcate. Flowers 1-5, stellate, white, outside brown-violet with cream margins, yellowish at the base. Filaments and anthers yellow. V - early spring to late spring. Fl - March. (in St. Petersburg April). Fr - June. Easily propagated by division. Does well in sunny places. Z 4 (3). New. T. orthopoda Vved. is closely related to this species. Kazakstan. Dwarf plants, only 5-7 cm. Good for rock garden and spring decoration. Z 5 (4). New. Central Asia (Pamiro Alay). On rocky slopes in open forests. Stem soft-pubescent, 30-50 cm. Leaves 4, almost erect, carinate, grey green. Flowers cup-shaped, elongated, 5-8 cm long, scarlet-red with yellow or black blotch with yellow border. Anthers dark violet. Closely related and similar to T. fosteriana, differing in form, size and position of leaves. V - early spring to beginning of summer, in St. Petersburg from April to June. Fl - April, May. Fr - June. P - by daughter bulbs and seed. Does well on any soil, if well-drained. Good for spring decoration and for cut flowers. Z 4. New. Central Asia (Pamiro Alay, southwestern part of Zeravshanskiy Range, Samarcandskiye Mts.). On stony slopes at 1,500 m.
Plants 40-45 cm. Stem thick, pubescent. Leaves 3-5, broadly ovate, glaucous. Flower buds acute, flowers fiery red, opening flat or cup-like in form. Blotch at the base varies from round to multiangular and in colour from black to yellow, with margin or without. Anthers dark violet, 2-2.5 times as long as stamens. V - early spring to summer. Fl - March-April (in St. Petersburg May). Fr - June. P - vegetatively and by seed. Full sun. Any soil. A well-known species which has given birth to many cultivars. Z 4. T. ingens T.M. 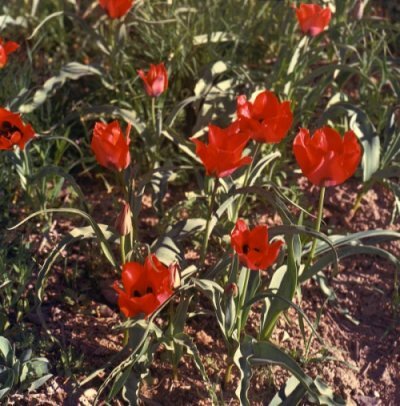 Hoog and T. eichleri Regel (both subgenus Tulipa) are closely related to T. fosteriana, both with red flowers, T. eichleri can easily be propagated vegetatively, by daughter bulbs. Good for any spring decoration. Z 4. Central Asia (Tien Shan, Dzungaria) and northern China. Among shrubs on grassy slopes, in rocky places. Plant 10-25 cm. Leaves 3-4, linear-lanceolate. Flowers solitary or sometimes up to 5, opening almost flat, stellate, 2-4 cm diam., bright yellow, violet-tinged outside. Filaments and anthers yellow. V - early spring to summer. Fl - March-April (in St. Petersburg May). Fr - June. P - by daughter bulbs and by seed. Prefers a sunny place, tolerates partial shade. Does very well in the rock garden. Z 4 (3). New. Central Asia (western Tien Shan). In low and middle mountain zones among grasses and shrubs, on stony slopes, in sandy places, frequently on clay slopes. Plant 30-40 cm, stem glaucous green, violet-tinged, pubescent above. Leaves 2-5, oblong or lanceolate, brown-striped. Flowers solitary (in cultivation sometimes with 2-5 flowers), 2-7 cm, cup-shaped opening almost flat. One of the most polychromatic species, flowers can be white, yellow or red. Often dichromatic, exterior segments carmine with light cream margin, interior cream or yellow. Filaments yellow, spirally twisting by the end of flowering. V - early spring to beginning of summer. Fl - March-April (in St. Petersburg May). Fr - June. P - by daughter bulbs and seed. A well-known species, source of many cultivars. Z 4 (3). Good for group planting and the rock garden. T. dubia Vved. 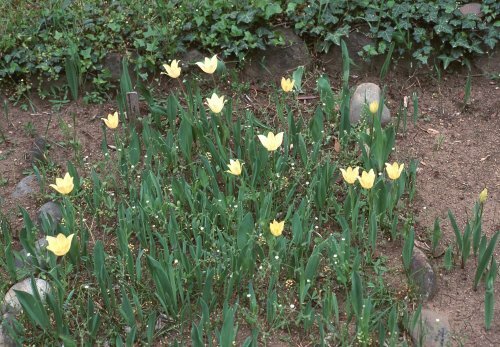 (subgenus Tulipa) is closely related to this species. Plant smaller, 10-15 cm, leaves 2, flowers solitary, cream inside and reddish violet outside. Recommended for the rock garden and group planting, for spring decoration. Z 4. New. Central Asia (Pamiro Alay). Clay and rocky slopes of hoothills and in mid-mountain zone. Plant 15-30 cm. Leaves 5-8, narrow linear, grey-green. Flowers single, scarlet-red, almost star-shaped when open, basal blotch blue-black. Filaments black, anthers violet. V - early spring to beginning of summer. F - April (in St. Petersburg May). Fr - June. P - by daughter bulbs. Very closely related to T. linifolia Regel, but differs in some characters: leaves not wavy, the first leave 4-5 cm above ground, comes to flower 2-3 weeks earlier. Requires a sunny position, well-drained soil. Does well in the rock garden. Z. 4. Central Asia (northwestern Pamiro Alay, Kopet-Dag) and Iran. Clay and stony slopes in foothills. Plant 20-40 cm. Leaves 3-4, grey green with brown-violet stripes. Flower 5-8 cm long, cup-shaped or elongated, raspberry red, grey tinged outside with bright margin. Filaments and anthers short, black. Basal blotch elongated, yellow-bordered. V - early spring to beginning of summer. F - March-April (in St. Petersburg May). Fr - June. P - by daughter bulbs and seed. Good for group planting and for cut flowers. Z 4. Central Asia (southeastern Pamiro Alay). In low and middle mountain zones, on gravelly soil, rocky slopes. Plants 20-30 cm. Leaves 3-4 (-6), erect, crescent-shaped. Stem and leaves hairy. Flowers 1-3 (5), cup-shaped, 4-6 cm long, brick-red, without a blotch. Filaments and anthers red (rare violet or yellow). V - early spring to midsummer. F - March, April (in St. Petersburg April, May). Fr - June. P - by daughter bulbs. Requires a sunny position, well-drained soil. Good for group planting, the rock garden and for cut flowers. Z 4. Central Asia (northern Tien Shan). Stony and debris slopes. Plant 5-15 cm, stem dark green. Leaves in rosette, 3-7, sulcate, light green, linear-lanceolate. Flowers 1-7, 3-5 cm in diam., stellate, white with yellow base. Outer segments green, creamy-margined outside. Filaments and anthers yellow. V - early spring to mid-spring. Fl - March (in St. Petersburg April). Fr - June. P - freely vegetatively, also self-sowing. Does well on any soil, very persistant. Can live for many years in the same place, once established. Full sun, also partial shade. Good for any spring decoration. Many years in cultivation. Z 4 (3). Central Asia (western Tien Shan, Angren River basin). Debris slopes, rocky soil, talus. Plant 15-20 (-40) cm, stem hairy, glaucous green. Leaves 4-5, glaucous, variable in size, crisp or slightly wavy. Flowers solitary, large, 2-7 cm in diam., cup-shaped, red, with yellow base, sometimes dark-bordered. Filaments and anthers yellow. V - early spring to beginning of summer. Fl - April (in St. Petersburg mid May). P - freely vegetatively and also by seed. Hardy, can grow in northern regions. Prefers full sun, but tolerates partial shade. Z 4 (3). New. Some other species (mostly from Central Asia) have been studied in St. Petersburg, and can be recommended for cultivation. Species marked * are new to cultivation. The short descriptions give stem height (in cm), colour of the flower and flowering period. The flowering period is given as it is in the wild (sometimes in the alpine zone), and it can be otherwise under other environmental conditions. The appropriate climatic zone and special requirements to soil are also indicated. *T. anadroma Botschantz. 30 yellow May Z 5 (4), indiff. T. dasystemon (Regel) Regel 10-15 yellow May Z 5, indiff.